We hosted a wine dinner with colleague Ken and his wife Daniella. 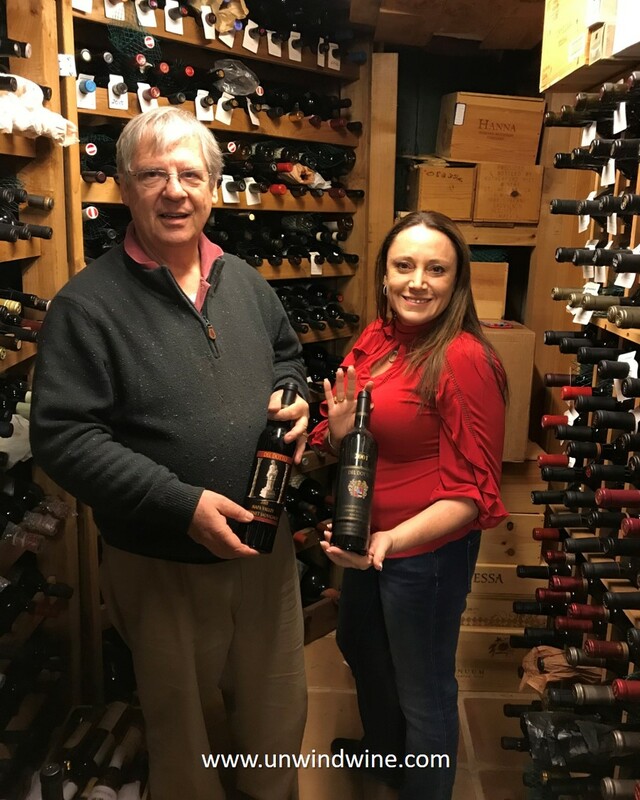 Touring our cellar to select some wine to pair with our steak dinner they saw our collection of Del Dotto Vineyards Estate wines, one of the widest held producers in our cellar. 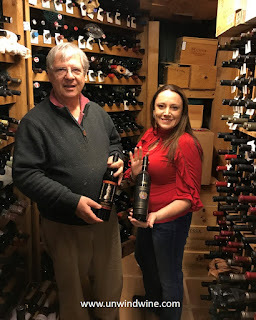 They talked of their visit to the Del Dotto Cave Tour and Tasting at the Estate winery in St Helena so we pulled a Del Dotto Cab to consider for our dinner flight. As I've written often in these pages, the Del Dotto Estate Tasting is an attraction in itself and the experience is one of the standouts in Napa Valley. My blogpost features our last visit there during our Napa Valley Del Dotto Estate Cave Tour and Barrel Tasting in 2017. We selected two bottles of Del Dotto Napa Valley Cabernet Sauvignon from the 2001 vintage, an Estate and a bottle from their Connoisseur's Series. This provided a comparison tasting of this vintage release aged in barrels comprised of two different oaks, the premise of the Connoisseur's Series. Del Dotto Vineyards and Winery in Napa Valley produce a unique offering featuring a wine aged in different oak barrels with different types of oak sourced from around the world. The premise is that different varieties of oak have specific characteristics that will act upon the wine differently resulting in subtle flavor variations. 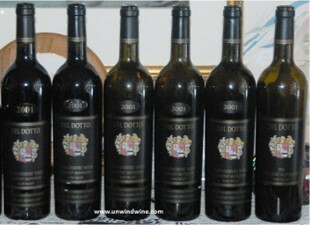 The Del Dotto Connoisseur's Series features as many as nine different oaks in which they age the same wine. Oaks barrels are produced with wood sourced from numerous forests around the world including America and France - French Allier, Bertranges, Colbert, Juppilles, Marsannay and Troncas oaks, and American Missouri and Minnesota oaks. Del Dotto also produce a 'D' Barrel (as in David Del Dotto) comprised of staves intermixed from several of the sources of oak. As with the whole collection, the resulting differences are subtle and may not be discernable except to the most discriminating oenphile, but they provide a unique and interesting tasting experience. 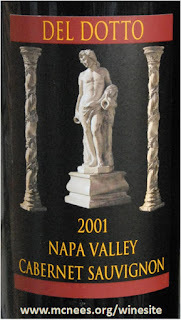 At seventeen years this wine may be past it's prime and won't improve with further aging, but it is still holding its own and may still be at or near the apex of its drinking window, which demonstrates the longevity of Napa Valley Cabernets. While it will not likely improve any further with aging, it may still have a few more years to go at this level. Medium to full bodied , deep dark ruby color - black berry and tangy black cherry fruits accented by clove spice and a hint cassis and whisper of English toffee on the 'Rutherford Dust' moderate silky tannin finish. The same wine as above from the same vintage release except aged in a different oak barrel as described above. Many folks might not recognize a difference between the two, and such differences could be due to bottle variations or differences in provenance (aging and handling history). Never-the-less I sensed slightly more oak in this release than the Estate bottling above, and slightly increased sense of sweetness in the oak. Of course I admit this could be conditioned on the suggestion of the packaging. In any event, the option provides for a comparison tasting and an interesting and fun experience. It might've been more apparent with more selections and variations on which to compare. Perhaps we'll have the occasion for this experience as we still hold a couple more bottles from the Series Collection. After dinner we opened this Nittnaus TBA dessert wine with a selection of fudges, artisan cheeses and Seasalt Caramel Chocolate Cake. Staying with the 2001 vintage of the Del Dotto cabs, we chose this vintage release dessert wine as well. Tea or honey color, full bodied, thick unctuous, bright full aromas and tastes of apricot accented by tones of fig, hints of peach and a layer of leather and smoke. The apricot fruit aromas are more pronounced than the tasted flavors which were a bit more subdued, giving way to the non-fruit notes of smoke and leather. Delightful and satisfying none-the-less.